Thanks to Scott Jackson, Daniel Ezra Johnson, David Morris, Michael Shvartzman, and Nathanial Smith for the recommendations and pointers to the packages mentioned below. The maps, mapsextra, and maptools packages provide data and tools to plot world, US, and a variety of regional maps (see also mapproj and mapdata). 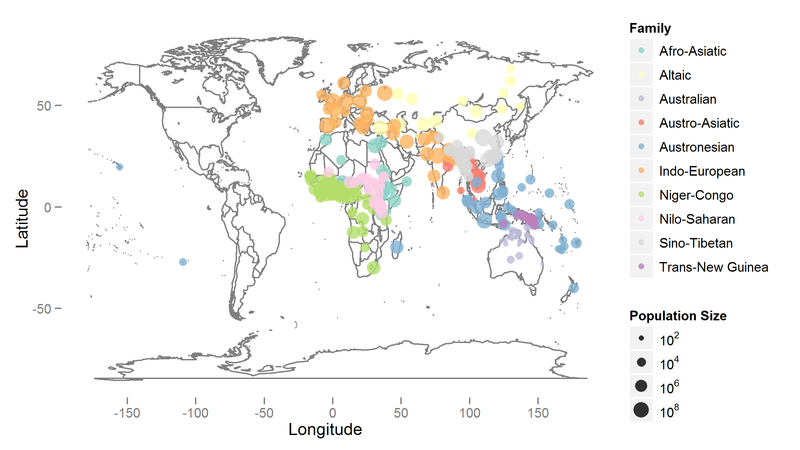 This, combined with ggplot2 is also what we used in Jaeger et al., (2011, 2012) to plot distributions over world maps. Here’s an example from ggplot2 with maps. Example use of ggplot2 combined with the maps package (similar to the graphs created for Jaeger et al., 2011, 2012). This entry was posted in Ever noticed?, statistics/R and tagged basemap, d3, ggmaps, ggplot2, leaflet.js, maps, plot, python, R code, rCharts. My new favorite library is the ellipse library. It includes functions for creating ellipses from various objects. It has a function, plotcorr() to create a correlation matrix where each correlation is represented with an ellipse approximating the shape of a bivariate normal distribution with the same correlation. While the function itself works well, I wanted a bit more redundancy in my plots and modified the code. I kept (most of) the main features provided by the function and I’ve included a few: the ability to plot ellipses and correlation values on the same plot, the ability to manipulate what is placed along the diagonal and the rounding behavior of the numbers plotted. Here is an example with some color manipulations. The colors represent the strength and direction of the correlation, -1 to 0 to 1, with University of Rochester approved red to white to blue. 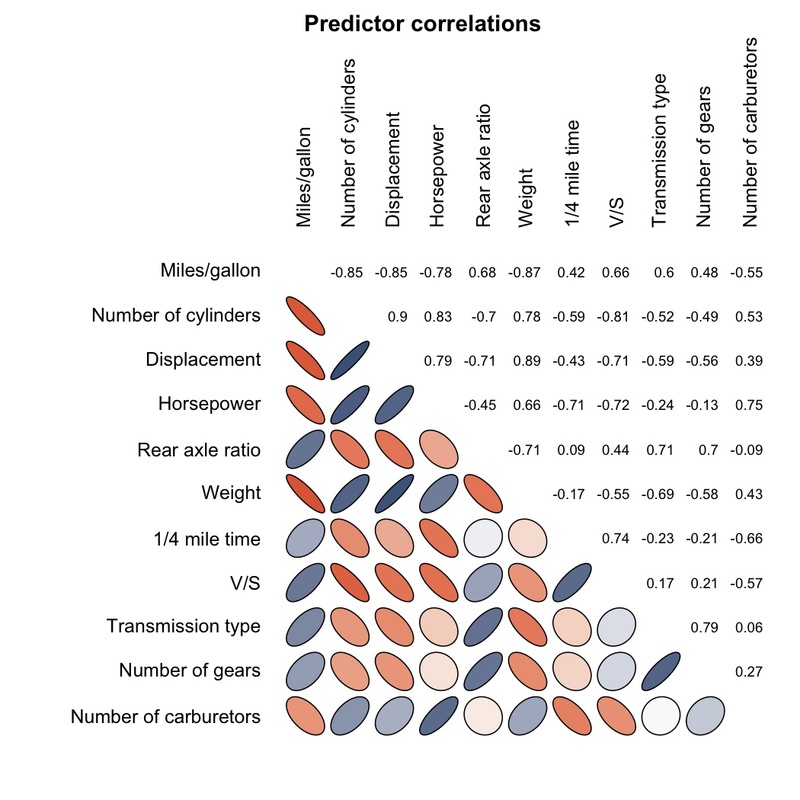 This entry was posted in corpus-based research, Ever noticed?, statistics/R and tagged correlation plots, R, R code, visualization. Left: Empirical means with error bars indicating standard error for four experimental conditions. Contrast presence is coded in color, adjective type in line type. The first vertical line indicates adjective onset, the second ones indicate mean noun onset in each contrast condition. Right: Smoothed model estimates of proportions in each condition, with ribbons indicating 95% confidence intervals. Data from different subjects is plotted in different panels. 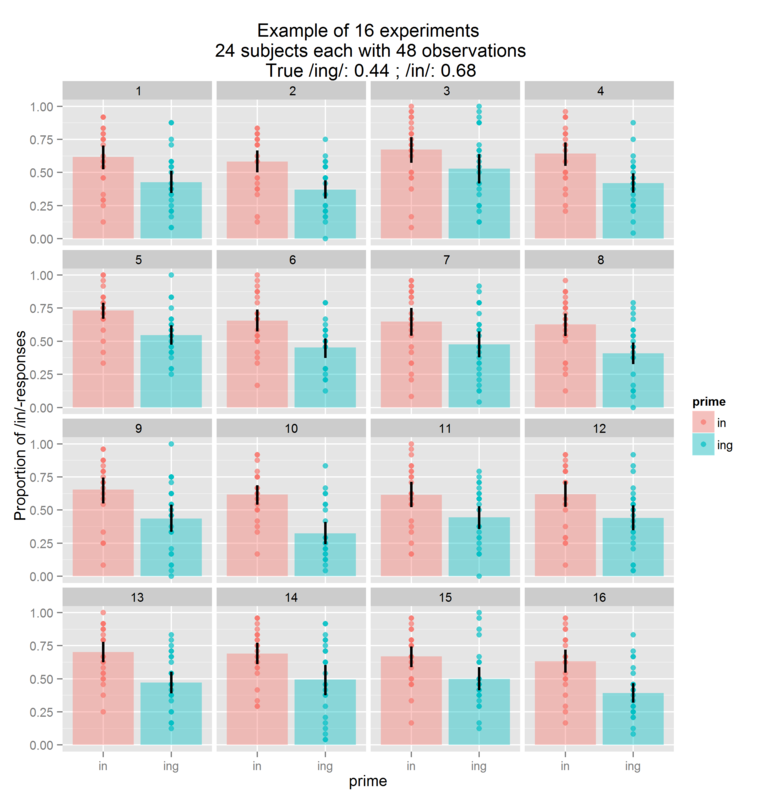 This entry was posted in class/tutorial, eye-tracking and tagged code, eye-tracking, ggplot2, R, R code, spaghetti plots. continuous and binary data using the lmer and glmer functions. MLwiN and Stata versions of these practicals are already available. This entry was posted in class/tutorial, For students, Statistics & Methodology, statistics/R and tagged mixed models, multilevel models, R code, regression.